Co-NP-completeness of minimal TSP tour? This problem came out of my recent blog post, suppose you are given a TSP tour, is it co-NP-complete to determine if it is a minimal one? Instance: Given a complete graph G with edges weighted with positive integers and a simple cycle C that visits all the nodes of G.
Question: Is there a simple cycle D that visits all the nodes of G such that the total weight of all the edges of D in G is strictly less than the total weight of all the edges of C in G? A sketch of a possible reduction to prove that it is NP-complete. 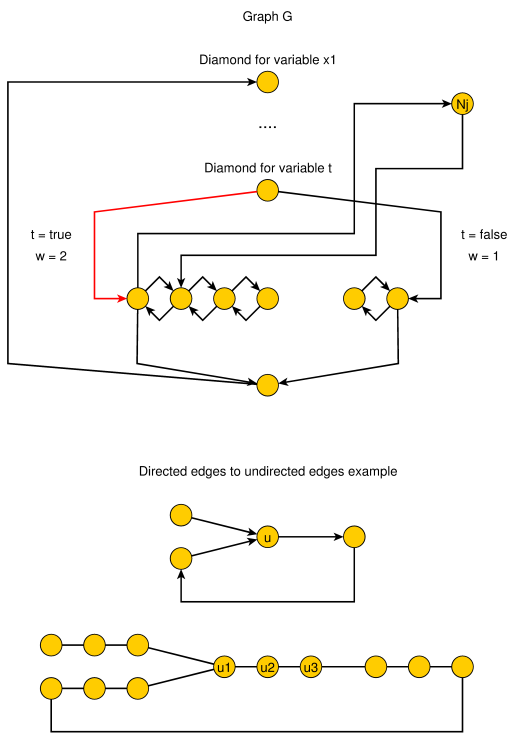 Convert the UNDIRECTED HAMILTONIAN CYCLE instance on $G'$ to a TSP instance $T$ in which all edges of $G'$ has weight $w = 1$, except the (unique) edge in the diamond going to the "positive" assignment of $t$ which has weight $w = 2$ (red edge in the figure below); finally the edges added to make $G'$ complete have weight $w = 3$. Clearly the TSP instance $T$ has a simple cycle that visits all nodes which corresponds to the satisfying assignment of $\varphi'$ in which $t = true$ (and this tour can be easily constructed in polynomial time), but it has total weight $|V'|+1$ (because it uses the edge that correspond to the assignment $t = true$ that has weight 2). $T$ has another simple cycle that visits all nodes with a lower total weight $|V'|$ if and only if the edge of weight $2$ that corresponds to the assignment $t = true$ is not used; or equivalently if and only if there is another satisfying assignment of $\varphi'$ in which $t = false$ ; but this can be true if and only if the original formula $\varphi$ is satisfiable. I'll think more about it, and I'll write a formal proof (if it doesn't turn out to be wrong :-). Let me know if you need further details about one or more of the above passages. As noted by domotorp an interesting consequence is that the following problem is NP-complete: Given a graph $G$ and an Hamiltonian path in it, does $G$ have an Hamiltonian cycle? Papadimitriou & Steiglitz (1977) have shown NP-completeness of this problem. Not the answer you're looking for? Browse other questions tagged np-hardness or ask your own question. Minimum-weight feedback edge set in undirected graph - how to find it? Is it NP hard problem? Does a weighted graph have a path with weight zero?